This report provides forecast and analysis of the global Crop Growth Regulators Market. It provides historic data from 2013, estimated data for 2018, and forecast data up to 2026 in terms of revenue (US$ Mn) and volume (metric tons). The report also includes macroeconomic indicators along with an outlook on crop growth regulators for global market. It includes drivers and restraints of the global crop growth regulators market and their impact on each region during the forecast period. The report also comprises the study of current issues with consumers and opportunities for crop growth regulators products. It also includes value chain analysis. In order to provide users of this report with comprehensive view of the market, we have included detailed competitiveness analysis and an overview of the strategy employed by key players in the crop growth regulators market. The dashboard provides a detailed comparison of crop growth regulators producers on parameters such as total revenue, product offerings, and key strategy. The study encompasses crop growth regulators market attractiveness analysis by product type, function, crop type, formulation type, and region. The report includes crop growth regulators market company profiles and the revenue generated from the companies across North America, Latin America, Europe, Asia Pacific and the Middle East & Africa. On the basis of product type, the crop growth regulators market is segmented as auxins, cytokinins, gibberellins, ethylene, and others. In terms of volume, auxins constitutes a much larger share in the crop growth regulators market than others. On the basis of formulation type, the market is segmented into wettable powders and solutions. On the basis of crop type, the market is segmented into fruits & vegetables, cereals & grains, oilseeds & pulses, and turf & ornamentals. On the basis of function, the market is segmented into promoters and inhibitors. PMR determined the volume consumption of crop growth regulators across various regions including North America, Latin America, Asia Pacific, and Middle East and Africa. Forecasting is done on the basis of an internal proprietary model using different macro-economic, industry-based demand driving factors impacting the market and its forecast trends by identifying and allocating a weighted score to forecast factors that influence the demand for crop growth regulators. These factors were the representative of an entire value chain, as well as the macro-economic indicators such as agri-produce scenario, total acreage planted, regulations governing the use of crop growth regulators, among others have been taken into consideration to arrive at the volume consumption of crop growth regulators in respective countries. For the calculation of market size, application of key types of pesticides were considered for each of the top countries and was mapped for key regions. This was followed by analyzing the overall share of crop growth regulators among different types of pesticides. The market sizing for crop growth regulators was estimated separately for key hormones and for ethylene as these product categories are available in different forms which helps in scrutinizing the market in an effective manner. The data validation was done through identifying the arable land in each region, per hectare yield, crop cycle and types of crop grown, and further amplifying the application rate of crop growth regulators per hectare. Product pricing has been collected at the manufacturer node to arrive at the market size for crop growth regulators. Weighted average selling price for crop growth regulators was considered to estimate the market size for top crop growth regulators consuming countries. These prices were captured in their respective countries and then converted into USD to offer forecasts in one consistent currency standard. 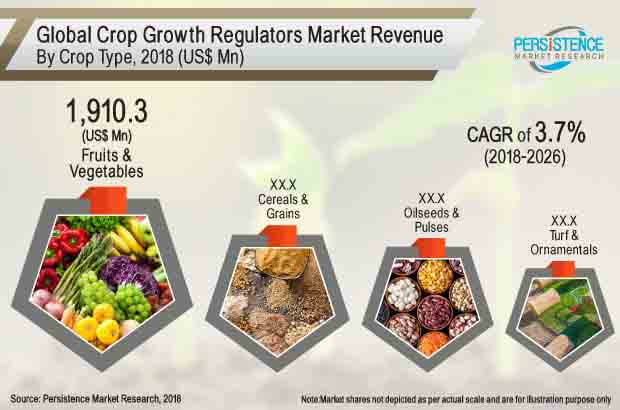 Given the characteristics of the market, PMR triangulated the data based on supply side, demand side, and dynamics of the global crop growth regulators market. To develop the global crop growth regulators market forecast, PMR analyzed various factors to understand their respective impact on the target market. However, quantifying the market across the abovementioned segments is more a matter of quantifying expectations and identifying opportunities rather than rationalizing them after the forecast has been completed. Another key feature of this report is analysis of the global crop growth regulators market and the corresponding revenue forecast in terms of absolute dollar opportunity. This is usually overlooked while forecasting the market. However, absolute dollar opportunity is critical in assessing the level of opportunity that a provider can look to achieve, as well as to identify potential resources from a sales perspective in the global crop growth regulators market. To understand key segments in terms of their growth and performance in the global crop growth regulators market, Persistence Market Research has also presented a market attractiveness index. The resulting index should help providers identify existing market opportunities in the global crop growth regulators market. The report provides detailed competitive and company profiles of key participants operating in the global crop growth regulators market. Crop growth regulators key players include BASF SE, The Dow Chemical Company, FMC Corporation, Valent BioSciences Corporation, TATA Chemicals, Adama Agricultural Solutions Ltd, Nippon Soda Co. Ltd, Sumitomo Chemical Co. Ltd, Nufarm Limited, Syngenta AG, Bayer CropScience, Arysta LifeScience Corporation, WinField Solutions LLC, Redox Industries Limited, Xinyi Industry Co. Ltd among others. The global agriculture sector is changing rapidly with increasing developments across the globe. Emerging markets are growing rapidly and have become major drivers of demand for food. Meanwhile, resource constraints are putting pressure on fragile supply-demand equilibrium, new technologies are emerging, and consumers in developed markets are taking a more active role in deciding what industry produces. A fundamental shift is redefining the industry structure. In the coming decades, a growing and increasingly affluent global population will demand a greater quantity, variety and nutritional value of food than the world has ever produced. Meeting this demand will require a 70% increase in food production, challenging a natural resource base that is already under significant strain. It will also require major increases in investment – by up to 50% for developing countries alone – in an era of economic crisis and austerity. Addressing these challenges effectively will require the use of productivity enhancing products such as crop growth regulators – one which leverages available resources to deliver economic growth, output, and opportunity, improved food security and nutrition, and environmental sustainability. Crop growth regulators are agrochemicals that influence the development of plants which are required at very low concentrations. There are natural regulators, which are produced by the plant itself, and also synthetic regulators; those found naturally in plants are called phytohormones or plant hormones. The crop growth regulators market is segmented on the basis of product type, formulation type, crop type, and function. The growth in the crop growth regulators market is boosted by the growing preference of crop growth regulators for crop production. Major shareholding companies looking out for ways in protecting and increasing the efficiency of growing cereals. Several key cereals producers in North America and Europe have been strategizing on improving their efficiency in terms of product offerings (pulses). In order to achieve their targets, these companies have been using several latest technologies and products, such as crop growth regulators, in their processes. In terms of revenue, the global crop growth regulators market is expected to represent an incremental opportunity of 252.8 Mn by 2018 end over 2017. By product type, the auxins segment is expected to register a CAGR of 5.1% in the crop growth regulators market. The Middle East & Africa region is expected to register relatively moderate growth in the crop growth regulators market, due to limited farming area. Globally, the quality of soil is declining due to various reasons such as overgrazing, agricultural activities, deforestation, overexploitation of land to produce fuel wood, and industrialization. Crop growth regulators influence the growth and differentiation of plant cells, tissues, and organs. They promote the fast growth of plants, no matter if they are fruits & vegetables, cereals & grains, or oilseeds & pulses, which indirectly helps in meeting the rising consumer demand for various types of food products. Hence, this one critical factor helps drive the demand for crop growth regulators. Advances in biotechnology have culminated in the revolution of the crop growth regulators market as manufacturers are increasingly focusing on the research & development of better and customized crop growth regulators products in the market. Hence, the development of disease-specific specialized crop growth regulators products, especially in the developed countries is on the rise. A major factor hampering the growth of the global crop growth regulators market is the concern for stringent regulatory norms regarding the use of the product. This is due to side effects such as allergic reactions and other health-related issues due to the consumption of food products which are administered with plant or crop growth regulators. Although crop growth regulators have been used in various segments of the food and beverage industry, over the past couple of years, their consumption has been low, which is attributable to limited regulatory approvals by respective legislations, owing to the health concerns of consumers across the globe. On the basis of region, the market in Asia Pacific is anticipated to dominate the global crop growth regulators market in 2018. North America is expected to gain significant market share in revenue terms by 2026 end. Moreover, U.S. is projected to exhibit significant CAGR during the forecast period, in the crop growth regulators market.